The CDU 8000 is a modular design Chemical Delivery Unit that gives a great deal of production flexibility in terms of production capacity variations and existing plan layout limitations. The complete solution is divided to two independent delivery units: SCD8000, Pump Delivery Unit and P8000, Pressure Delivery Unit. 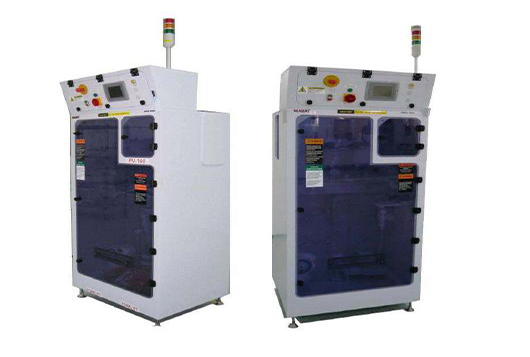 The units are capable of delivering allocated amounts of Acids, Alkalis or Solvents to its final destination with high reliability, accuracy, and with exceptional quality control. Being a modular unit, CDU 8000 allows work at several modes in parallel with automatic programmed switching and without any interruptions to the process. This makes each unit to function as a self backup to the CDU. and routinely deliver filtered chemicals from the day tanks to process. apply constant pressure on the liquid in order to provide smooth flow and fine control on the rate of delivery. CDU 8000 subsystem, in addition to one or more SCD units (operating in parallel). The CDU8000 is offering full redundancy and automatic backup to support frequent flow to the POU. Cabinet MOC Stainless steel for solvents.